Botswana is, without doubt, one of Southern Africa's most rewarding safari destinations. If you're planning your trip around the country's plentiful wildlife, the best time to visit Botswana is during the dry season, which usually runs from May through October. At this time, the grass is lower, and the trees have less foliage, making it easier to spot hidden animals in the undergrowth. A shortage of water causes wildlife to congregate around permanent water holes, or to make a daily pilgrimage to the river. As a result, this is the best time for wildlife viewing in the Okavango Delta, and along the Chobe River. There are several exceptions to this rule, however. Wildlife viewing in the Kalahari Desert is often better during the summer rainy season, although temperatures are scorching and some camps close later on in the season. Birding is always best in summer, with migrant species attracted by the insects that hatch in the rain. For those on a budget, the rainy (or green) season offers discounted prices on accommodation and tours, allowing you to stay longer and do more. Botswana has a semi-arid climate that is mostly hot and dry, and the country's dry season that's a popular time to visit is countered by a distinct rainy season that offers benefits of its own. The dry season is winter in Botswana, a relative term considering that daytime temperatures hover at around 68 degrees Fahrenheit. Nevertheless, nights can get chilly, especially in the Kalahari Desert, where early mornings are positively freezing. If you're planning a trip during the dry season, you'll need to pack plenty of layers for dawn drives and night safaris. Toward the end of the season, temperatures start to rise dramatically, peaking at around 104 degrees Fahrenheit. The country receives the bulk of its rainfall during the main months of the rainy season, December through March, but rains are typically limited to quick afternoon showers and will rarely spoil a trip. Temperatures, however, can be quite high. In Botswana's most iconic reserves, the dry season is the optimum time for game-viewing. However, it's also the country's busiest season. July and August are especially popular as they coincide with the northern hemisphere's summer school holidays. Prices are at their highest, and you'll need to book your safari up to a year in advance during peak season. Nevertheless, small camps and remote destinations accessed exclusively by charter plane mean that even in winter, Botswana is rarely crowded. September through December is Botswana's shoulder season and what most travelers would generally think of like spring. During these months, temperatures soar, and the land is parched, but prices are already falling, and if you're lucky, you may be in place to watch the transformation triggered by the first rains of the season. Migrant birds are active during this time, and their arrival, typically in September, often coincides with the first rains. In addition to birds like yellow-billed kites and the carmine bee-eaters, Botswana's flora is in bloom as well—you can see colorful acacia trees, baobabs, sausage trees, and apple leaves. Temperatures typically range between 91 and 95 degrees Fahrenheit during the day, dropping to 55 to 64 degrees Fahrenheit at night. Botswana Day is celebrated on September 30. On this day, citizens hit the streets to commemorate the advances their country has made since declaring independence from Britain in 1966. Expect street parties, parades, and more. Many Botswana citizens are Christian and celebrate Christmas. It's a major holiday in the country, so you can expect incredible African-style caroling and other festivities. Summer, which begins in December and ends in March, brings high temperatures and heavy rains. Most of Botswana's rainfall occurs during this season. Some years it can come early, sometimes it doesn't come at all. But when it does, the landscape completely transforms, and it's a beautiful sight. Birds arrive from other areas of Africa, Europe, and Asia in the thousands, and the country's wildlife enters into a season of new life with baby warthogs, zebra, and impala nearly everywhere. Animals are harder to spot amidst the lush new growth—but for some, that's part of the challenge. During this time, zebra and wildebeest begin their migrations in the Makgadikgadi, Savuti, and Linyanti regions. Many antelope species, as well as warthogs, give birth during these months. If you're hoping to see predator-prey interactions, these months provide the best opportunity. Botswana goes on sale during the green season and for many people, this makes it the optimum time to travel. Although some camps shut down for the rainy months, many stay open, using discounted rates to attract out-of-season visitors. Flooded roads aren't as much of a problem as they can be in other African countries, because several of Botswana's key destinations are only accessible by plane. Rain isn't constant at this time. Instead, days are often sunny with brief downpours each afternoon. The real downsides of the green season include sweltering temperatures combined with high humidity and an influx of insects, including mosquitoes. Ironically, the Okavango Delta floodplains dry up at this time, so many camps are unable to offer water-based safaris. For many visitors, poling silently through the reeds on a traditional canoe (or mokoro) is the defining highlight of a trip to the Okavango, an experience that one may have to sacrifice during the summer months. 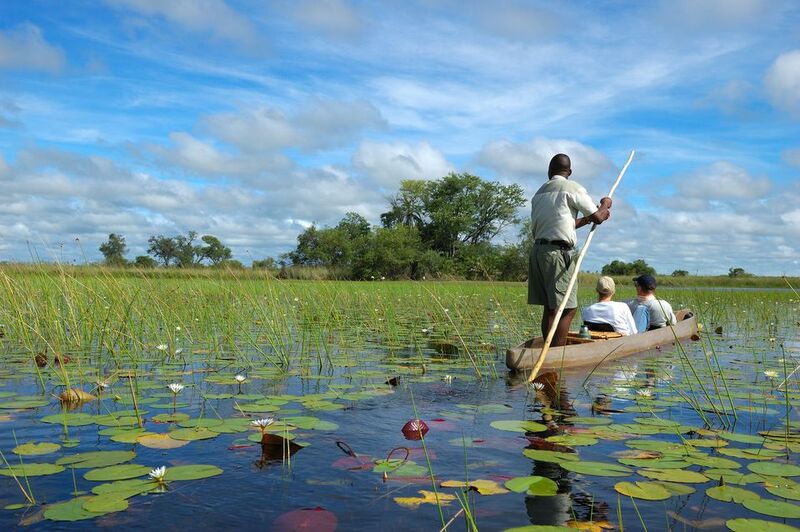 Botswana celebrates World Wetlands Day in February. This popular event focuses on the environment and conservation, both top issues within the country. The Maitisong Festival is a major March celebration held each year in Gaborone. The festival lasts nine days and includes traditional music, dance, and theater. Winter in Botswana occurs from April to September, which includes the country's dry season. The flood waters have made it down into the delta, attracting huge numbers of wildlife from the dry interior. You'll see large herds of elephant, buffalo, and antelope, in addition to the predators that feed upon them. The dry season is also less humid, and there are far fewer insects. If you're concerned about catching malaria or other mosquito-borne diseases, dry season travel gives you added peace of mind. Days are mostly dry, sunny, warm, and clear, with temperatures averaging 77 degrees Fahrenheit during the day. Temperatures can drop as low as 35 degrees Fahrenheit at night. If you're interested in learning about Botswana's incredible tribal culture, don't miss the Maun Festival, a two-day celebration held each year in April. Traditional poetry, music, and dance are celebrated. The Tjilenje Cultural Festival is held in May in Nlapkhwane, a town in the country's northeastern region. This traditional celebration features ancient games, dances, and local food and drink. Fans of off-road motorsports won't want to miss June's Toyota 1000 Desert Race, which includes quads, bikes, and cars racing across the country. Botswana celebrates President's Day in July. This four-day national holiday includes speeches, dance performances, and more.